Ever wonder if the legend is true? 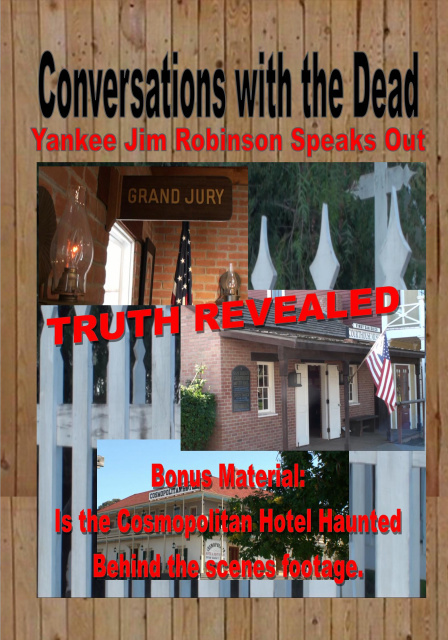 If Yankee Jim Robinson was not hung on the grounds of Whaley House, why does his spirit still reside there? Finally the truth will be revealed. Intro to the DVD filmed in front of the newly renovated Cosmopolitan Hotel in Old Town San Diego. Inside Room 4/5 at the Cosmopolitan Hotel speaking with a Madam who says her name is Emily Ann and verification by the Cosmopolitan InnKeeper. "Inside Room 4/5 at the Cosmopolitan Hotel speaking with a Madam who says her name is Emily Ann and verification by the Cosmopolitan InnKeeper. Although the Cosmopolitan Hotel doesn't offer the fancy amenities that many exotic Hawaii or Jamaica hotels have to offer, but it does offer plenty of excitement! Especially for paranormal enthusiasts! You may not find an exclusive beach front at the Cosmopolitan Hotel, like you would at many resorts in Dominican Republic or Puerto Rico, but you will find a history so rich your stay will be all but forgotten." Whaley House Grounds? Does it make any sense for Yankee Jim to be hung on the grounds of Whaley House before the house was built? The jail was right next to El Campo Santo Cemetery and Whaley House is several blocks away.